Booknotes: Michel Faber's Extraordinary New Novel The Book of Strange New Things. Michel Faber's Extraordinary New Novel The Book of Strange New Things. Here is the big book you should read over the Xmas/New Year holiday season. It is simply magnificent. It is such a rich, multi-dimensional novel: full of meaning and suggestion, which deepens its focus as it proceeds. 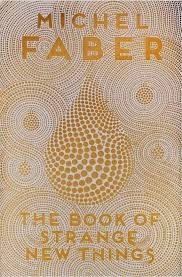 Faber serves up a wealth of challenging ideas embedded in an absorbing narrative. And he seduces with beautiful, clear, silken prose. The plot is simple enough. Peter is a Christian missionary selected to join a team of specialists housed in an enclosed facility on a distant planet. They are employed by a mysterious corporate outfit called USIC. Indigenous 'aliens' also inhabit the planet. Peter is an embarrassingly unsophisticated God-botherer. Naive, simple-minded, and constantly sprouting theologically insipid, sentimental claptrap. Some readers will be put off by this, which is unfortunate as there is a substantial point to it which becomes clear as the novel proceeds. His job as part of the team is to venture beyond the complex to befriend and 'civilise' the natives so they cooperate and continue to grow food for the colonisers. Peter's wife, Bea (Beatrice), was disallowed by USIC from joining him on his mission. They communicate via email. As the narrative progresses these brilliantly written emails become the heart and soul of the book, and paint the passionate and increasingly feral Bea as a riveting fictional creation. There is enormous drama in their relationship. They love each other with an extreme, perhaps questionable, intensity. USIC's residents, including Peter, were all damaged people in their previous lives - drug addicts, alcoholics, petty criminals, beggars, abusers. They couldn't handle the rough and tumble of the world and USIC provided an escape. The notion of escape develops as a major theme, suggesting too that god belief is little more than a vacuous coping mechanism, a psychological crutch. Some readers will question the way the novel ends, perhaps with a whimper rather a bang. But in my view it is perfect. Perfectly real. I can't recommend this fascinating novel highly enough.